Let's here it for the boys in blue! Blue Man Group is teaming up with Autism Speaks for a third consecutive year and will be hosting autism-friendly performances suitable for individuals and families affected by autism in Boston, New York, Las Vegas, Chicago and Orlando. An autism-friendly performance is scheduled for Boston at the Charles Playhouse on June 25 at 11:00AM. "We are overjoyed that Blue Man Group is continuing their partnership with Autism Speaks for a third year," said Lisa Goring, Chief Program and Marketing Officer at Autism Speaks, in a statement. 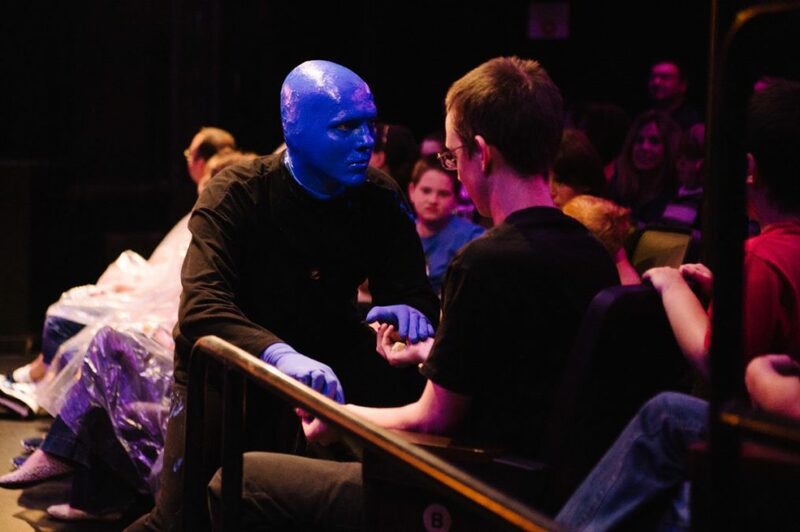 "This partnership raises funds and provides families the special opportunity to experience Blue Man Group in a setting that meets their needs. We are grateful for this commitment to the autism community." Tickets for these special performances in Boston, New York, Chicago and Orlando will be discounted, and $5 from each ticket will be donated to Autism Speaks. For more information, visit blueman.com/autismspeaks. For the autism-friendly performances, slight modifications will be made to the shows, including reducing sound and light levels at various moments and making earplugs available upon request. The Blue Men will keep their approach to the audience more subdued and limit the amount of direct interaction with the audience. Blue Man Group will also create calming environments outside the performance for families seeking a break from the excitement. "We've heard from many families affected by autism that their children responded to the Blue Man character in a very moving way. We don't know the exact reason. We can only speculate that it has to do with the Blue Men communicating in their own unique way—non-verbally, through visuals, touch and sound. Their message often resonates on a deeper, more sincere level," said Phil Stanton, Blue Man Group co-founder. "Once we knew that we could be helpful or provide an outlet for those affected by autism, we felt it was important to do more. With our sensory-friendly shows, we want to create a safe and welcoming environment for individuals and families affected by this disorder, in the hopes that they can have an entertaining and joyful experience together." Blue Man Group is an award-winning global entertainment company best known for its creative stage productions around the world. It developed through collaboration between three close friends, Chris Wink, Phil Stanton and Matt Goldman on Manhattan's Lower East Side. Blue Man Group currently has ongoing theatrical productions in Las Vegas, Orlando, Boston, Chicago, New York and Berlin, along with a North American Tour.